Trail 1-1.5 hr up to the Pass into Dennis Ck. Allow plenty of time to further explore ridges and flowers. Very much like a trip to Idaho Peak with more flowers, less people, more wilderness. The trail to Dennis Basin begins where the 4X4 road ends. It is a steady climb with lots of excuses to stop and admire the views and the flowers. Climbing up a skid trail through an old cut block rampant with flowers, the trail soon narrows as it enters a sub-alpine forest. It continues to climb, following a small stream, emerging from the forest into a basin below the pass where frequent bear diggings warn you to be alert. You will see your destination, a low pass, up and to the left. Follow the stream to the base of the talus slope. The trail is to the left. Cairns mark the route. Early in the season, the trail may be snow covered requiring some route finding skills. As you climb steadily upward, the views unfold, and the sight of the pass ahead urges you on. The pass, which an hour and a half ago was your objective, now is a minor victory as your eyes take in the panoramic view. This is a good place to stop and have a bit of lunch while you decide which ridge to walk … which flowered slopes to explore. 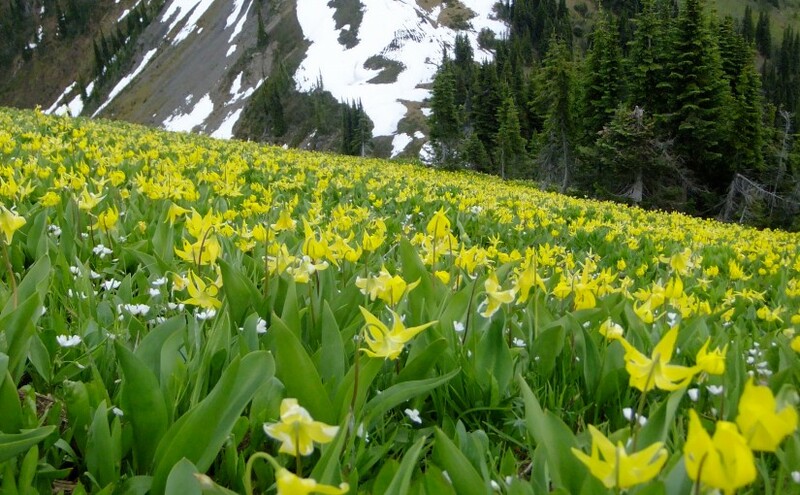 One of the best flower shows is usually to your left, on the ridge between Marten and Dennis Creek. From this ridge, one has spectacular views of Mt. Dolly Varden, Marten Mountain, Inverness Mountain, Mt. Dryden, Whitewater Mountain, London Ridge, Kokanee Glacier and the New Denver Glacier. A perfect place to sit and plan your next hike. Driving Directions:Turn off Highway 6, at Rosebery, onto the “East Wilson Creek Road”. This road soon turns into the “Wilson Creek Forest Service Road”. Follow this good, 2 wheel drive, gravel road for 2.6 km. Turn right onto the “Hicks Creek Road”. From here on the road steepens and gets rougher. A high clearance vehicle with good tires is advised. 2.7 km up the “Hicks Creek Road” there is a fork in the road, stay left. The road continues to climb steadily for another 7.6 km. Look for a 4×4 post on your right, painted brown with white lettering, signed “Dennis Creek Trail 1 km “. This last bit of road is steep and rough, climbing 122 m (400 feet) in 1 kilometre. It is best suited to a 4 wheel drive, so you may want to leave your vehicle at the beginning of this last kilometre of road. Another 4×4 post, signed “Dennis Creek Trail” marks the trail head.